Harbor Frieght Dust Collector Modification, or, not leaving well enough alone! #4: Good enough for now! I have created four zones, so to speak, for my D.C. upgrade. They are controlled with four 4” blast gates all located close together and close to the D.C. I will only use one zone at a time for maximum efficiency. 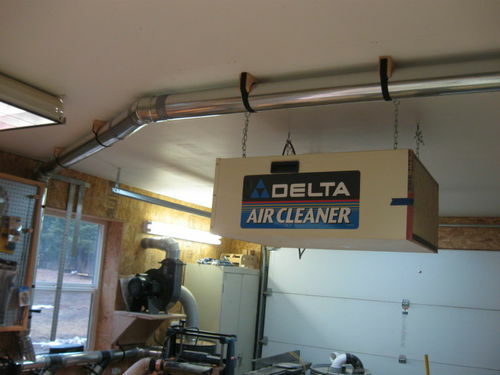 I used a combination of D.C. fittings, blast gates, sheet metal fittings as well as sheet metal duct work. Now an explanation of the various zones. 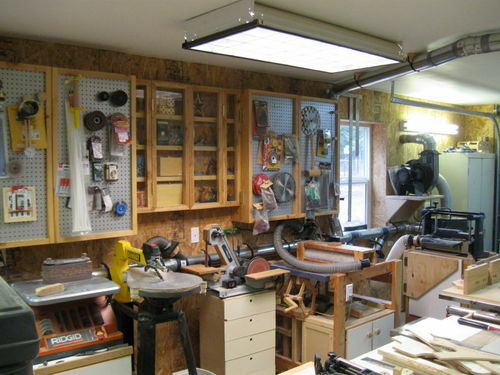 The first zone on the right is dedicated to my planer and later to my joiner once I get it modified. 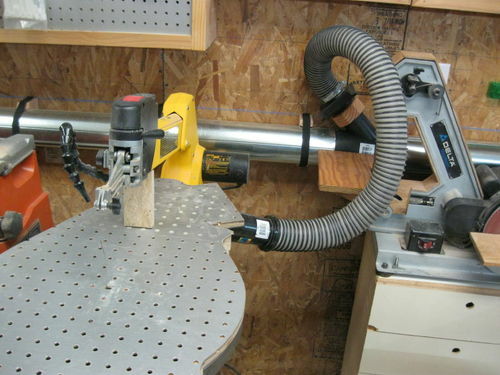 The second zone is dedicated to my table saw for now but I plan on sharing this zone with my router table and possibly use it as a floor sweep. 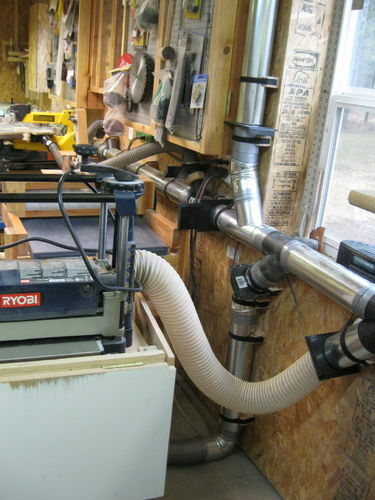 The third zone runs across the ceiling of my shop and is dedicated to my miter saw. This freed up my shop vac which I had been using for this purpose. 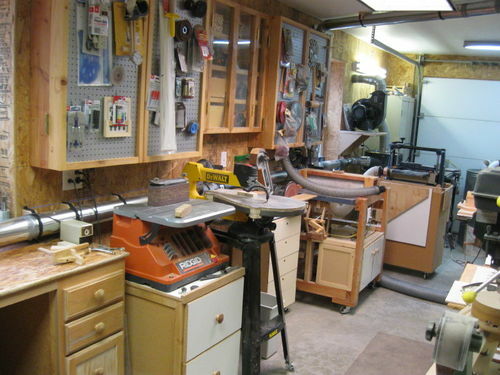 The fourth zone, and longest one, services four tools, my drum sander, combination belt/disk sander, scroll saw, and spindle sander. All these tools are mobile. 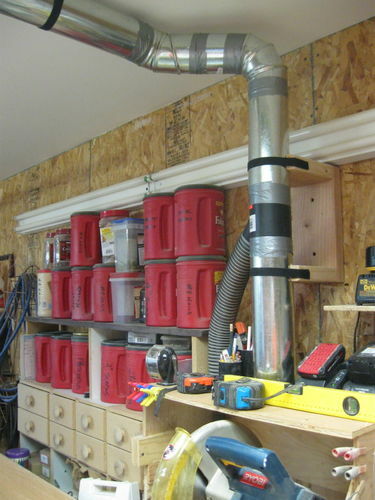 Oh, I have an air filtration unit sitting above my table saw. 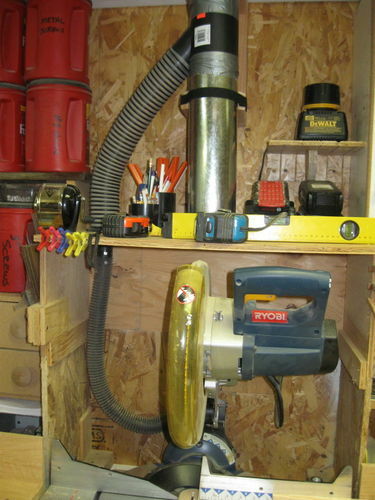 Zone four, spindle sander, scroll saw, belt/disk sander, drum sander. Two tools share a 2 1/2” port with blast gate. This is as far as I a going right now with this system. I still have my Jet D.C. which I plan on using for my lathe and drill press. That is it for now. I don’t pretend to be an expert on designing D.C. systems, this just suited my needs the best. It is a step up from what I had. Thanks for all your comments and suggestions, I appreciate every one of them. Looking good. It looks like all of your blast gates are located close to the dust collector unit. Since I located all my blast gates close to the tool for which that blast gate opened up for vacuum to that tool, my question is there any special reasoning that I missed? I’m wondering if your system doesn’t reduce loss of vacuum by not have long runs to tools before the blast gate is there to turn off the vacuum. Thanks for the posts and your thoughts—always enlightening. I think you have a great set up Lee. It is a lot more work than meets the eye. I definitely have to build something around my miter saw similar to yours. Those are one of the dusty ones. Why not have the blast gates by the tool unless you need to go by the D.C to turn it on. And or (suggestion only) I installed 3 way switches for my D.C and shop vac. so I can turn them on at 2 different locations. Saves a lot of steps. Or maybe you have a remote and I missed that. John, thanks for your comments. Since three of the four zones service only one tool which is at the end of the zone I opted to group the blast gates closer to the D.C. so I can open the zone I want at its source while switching on the D.C. My thinking, such as it is, was that if I wasn’t using a tool on a particular zone why leave all that duct work open? I duct taped the joints but I still might have leaks in the various runs. Having said all that I could reconfigure my system to be like yours with little trouble later on. 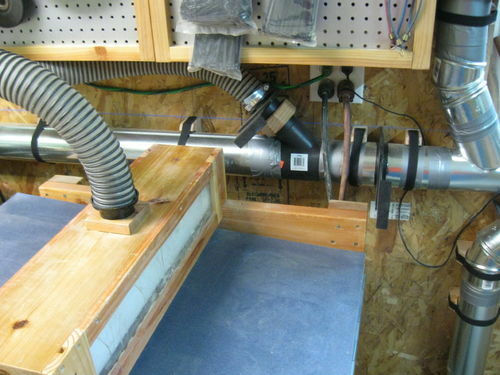 John, I also see the 4’’ main connected to the miter box you built around the miter saw. Is that smaller hose connected directly to the saw? Interested cause I really need to cut back on sawdust from the miter saw. Dave, you are seeing things right, the smaller hose is connected to the exhaust port of the miter saw. 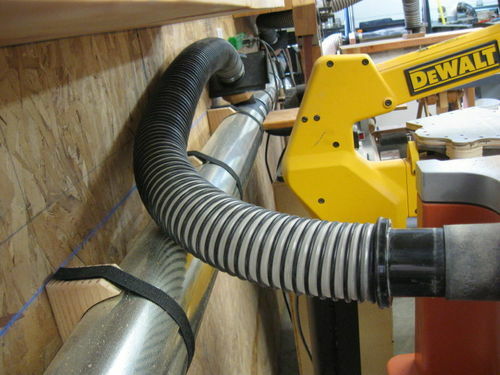 The 4” duct creates a negative pressure around the saw to keep the saw dust from escaping the enclosure. Thanks Norm, I appreciate your comments. Notw, good luck with your D.C. system. Thanks for your comments. Looking good Lee. 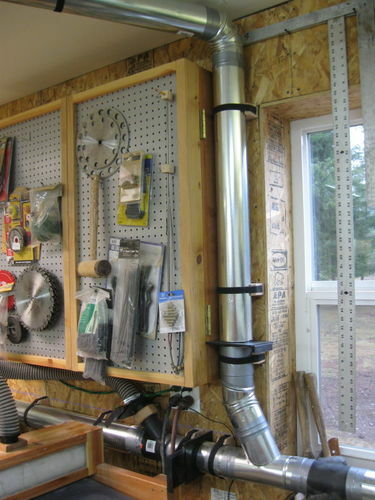 How is the suction on the end that goes up and across the ceiling? Thnx in advance. I’d like to get my hoses off the ground one of these days. Yes, Lee. Thnx a bunch. 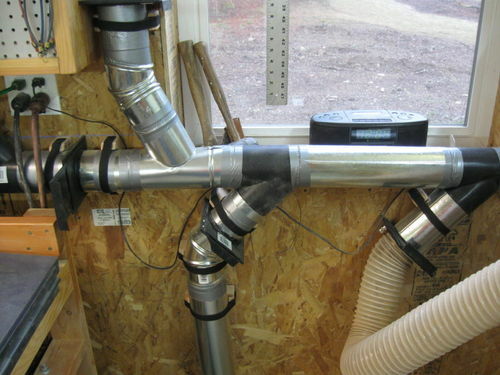 So I am curious as to why you went with metal ducting over a plastic? Cost? Safety? Preference? I’m assuming that the metal ducts are seamless? Are your connections just duct taped or did you rivet before taping? Thanks for sharing your shop with us. It’s educational seeing how others make things work in their shop. Hi Paul, I felt that the metal ducting provided less friction as some of my runs are 20’ long. 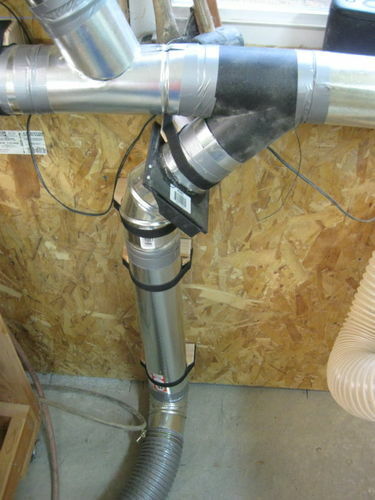 The ducting is not seamless and the connections are just friction fit and duct taped. I preferred the light weight of the metal over the PVC.